We are deep in a drought again this year. Farmers had a good first cutting and some even a second cutting, but then the rain dried up and so did the grass and everything else. Last year, hay was trucked to Oklahoma from other states, but this year those other states are also needing hay. Many folks are already having to feed hay. 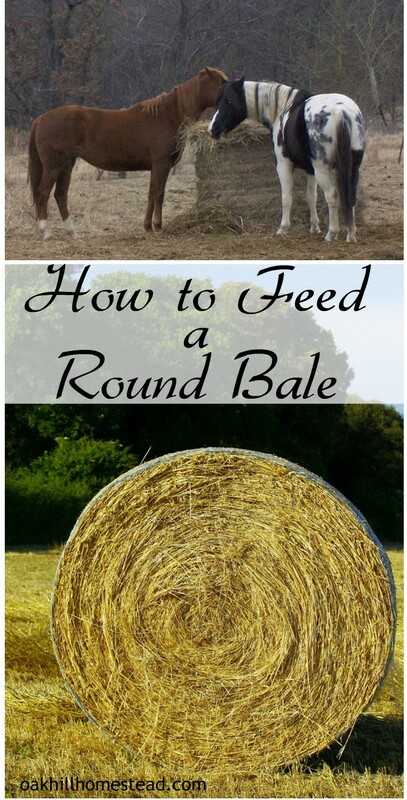 Hay comes in different sizes. There are small square bales, the only kind I was familiar with before moving here. There are big round bales, and bigger round bales, and large square bales that are usually 3'x3'x8' - not really square, but then again, small squares aren't square either. Small squares are the easiest to store because they stack so nicely. They are easy to put on the pickup truck to bring home. They are easy to open and easy to feed. Just stick the "flakes" of hay in the feeders and you're done. Of course if you raise cattle or have a lot of horses, small squares aren't as easy to feed, and surely not the most economical: small squares are the most expensive. Large squares are being offered for sale more and more here in our area. They are relatively easy to feed: you pull off a 3' x 3' flake (oh, that's probably where the "square" comes from). Most people then break the big flakes into smaller hunks and that's where "easy" ends. The bales stack well for storage, IF you have a tractor to stack them with. They fit in a pickup IF you have an 8' long bed, and IF you have a tractor to load it with (most places you buy them will load it for you). It's not so easy to get them out of the truck. A friend of mine says she ties the bale to a tree and then drives the truck out from under it. Of course, once it's on the ground it's not going anywhere else, and we don't have any convenient trees like that. 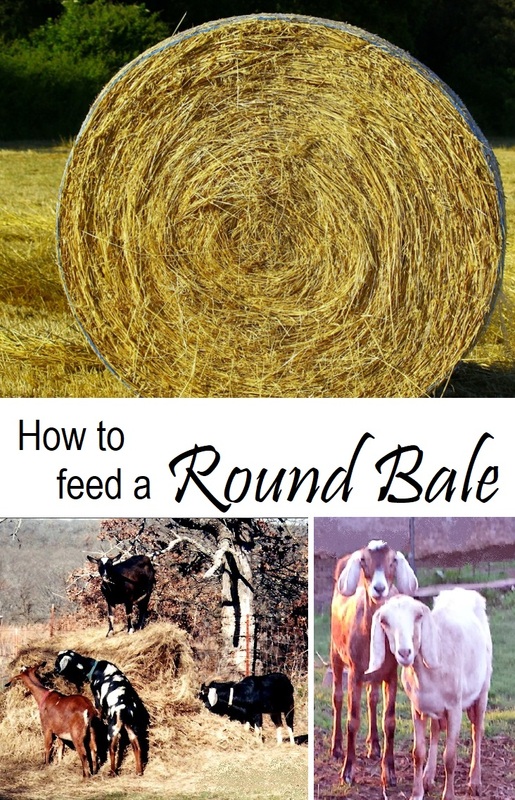 Round bales are more economical than squares, especially if you have more animals to feed, and are the most widely available here in Oklahoma. You can plop it in the pasture, cut the strings, and let the horses eat at will. It's easy. It lasts longer so it's less work. The feed store will load one into your pickup for you. Unloading is easier than a large square bale, and hubby enjoys this part: back up to approximately where you want the bale, stop, then stomp on the gas pedal and pull forward rapidly so the bale rolls out. Sometimes it takes a few tries, which is even more fun. But goats take forever to finish up a round bale. They climb on top of it, poop on top and then refuse to eat the soiled hay (not that I blame them). And horses aren't neat eaters either. The hay slides off the top of the bale to the ground. The horses stand in it, spread it around the ground, sleep on it, and poop on it. There is a lot of waste when you feed round bales directly - no matter who you feed it to - so I've learned how to peel hay off of the round bales. 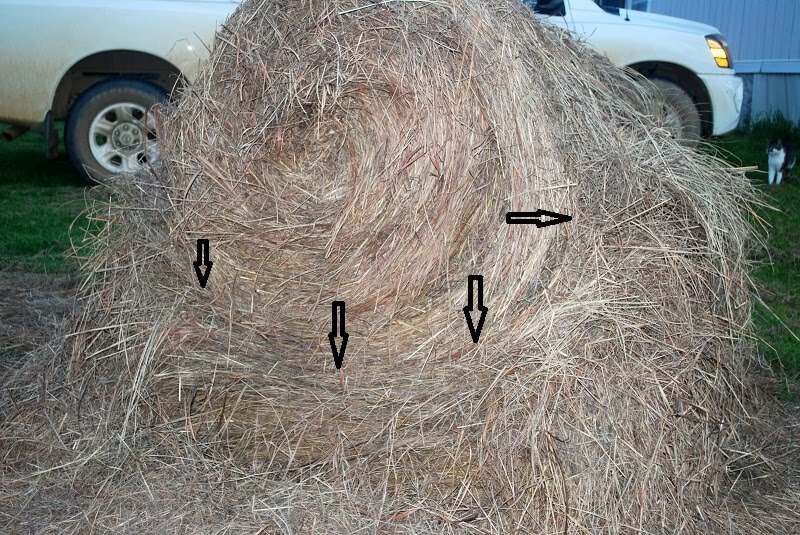 Set the bale on the round side, not the flat end. (This is how it usually lands when it parts company from the pickup, however, it will occasionally fall over. It will take at least two people to get it back on its side again.) Remove the strings or netting. Remove the top layer of hay, which is often spoiled by the weather and unfeedable. Put this on the compost pile or on top of your resting-for-the-winter garden - but be aware that if there are weed seeds in the hay, they will end up in your garden soil. 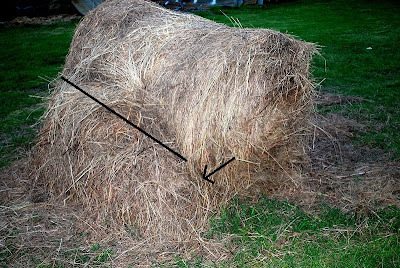 Peel the hay in layers off the top of the bale, getting as close to the bottom of the bale as you can, as much as you need at each feeding. You'll only be able to remove "so much" of it at the bottom, and eventually you'll end up with the middle of the bale sitting in a "cradle" of hay. This hay that I've peeled off is what I feed each day. 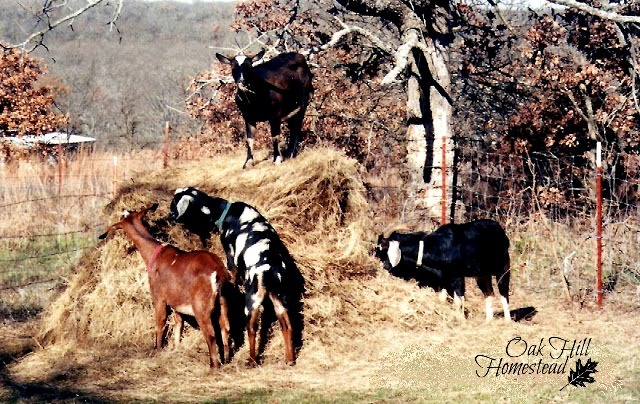 I fill the goats' feeders with it, and the horses each get a pile of it on the ground. A pile for each horse, that is, so that the "bully" can't hog it all. Now you can try to push the middle from one side, so that it is parted from the cradle and ends up on the ground. Sometimes it's still too heavy for me, and I might have to work at it for a few days to get it to the point of being moveable. But that's ok, I just keep peeling it off the top and feeding my hungry animals. Once you get the core on the ground, you can remove hay from the cradle as needed. And then you're left with the core. This is the fun-for-me part (remember that hubby's fun was getting it off the truck; this is the part I enjoy). I push the core around the yard, so that it unrolls on the ground. I pick up the unrolled layer and feed that. I push the core a ways, pick up and feed the hay, roll the core back up to where I started, and roll it out again, feed that hay, roll it back to the starting point again, back and forth, repeating as needed. 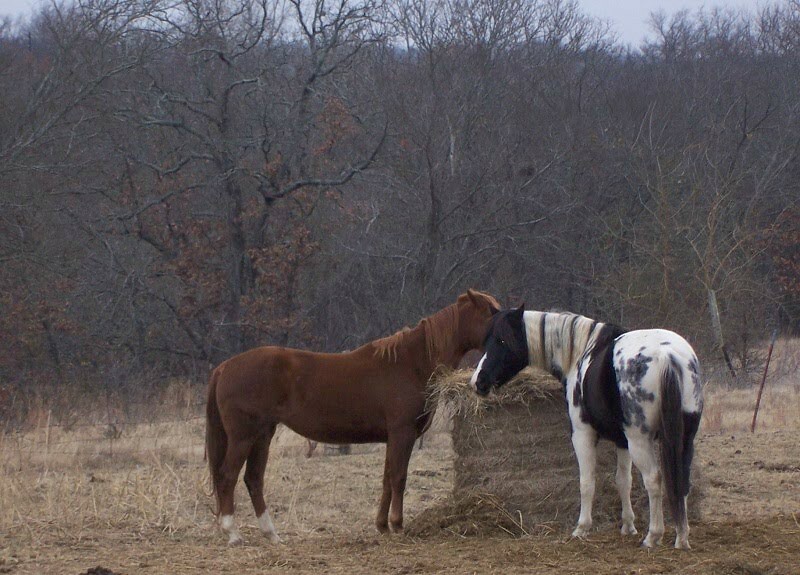 And finally comes the day when I give the horses the very middle of the bale and they snack all day till it's gone. Time to open a new bale.